Radiation delivery to cancer patients for radiotherapy is invariably accompanied by unwanted radiation to other parts of the patient's body. Traditionally, considerable effort has been made to calculate and measure the radiation dose to the target as well as to nearby critical structures. Only recently has attention been focused also on the relatively low doses that exist far from the primary radiation beams. In several clinical scenarios, such doses have been associated with cardiac toxicity as well as an increased risk of secondary cancer induction. Out-of-field dose is a result of leakage and scatter and generally difficult to predict accurately. The present review aims to present existing data, from measurements and calculations,and discuss its implications for radiotherapy. Contemporary external-beam radiotherapy treatment approaches are capable of conforming a focused radiation beam tightly to a defined target volume. Despite the high conformality achievable with modern methods, unwanted doses are nonetheless delivered to untargeted regions of the patient's body. These doses from outside the primary beam are herein referred to as out-of-field doses, which arise from leakage from the medical linear accelerator (linac) treatment head, scatter from collimation devices and scatter from within the patient's body itself. The increasing efficacy of modern radiotherapy techniques for treatment of cancers is successful in lengthening patients' lifetimes. The unfortunate corollary of this is that there is therefore longer time in which treatment-induced health complications - such as secondary cancer - may become manifest. 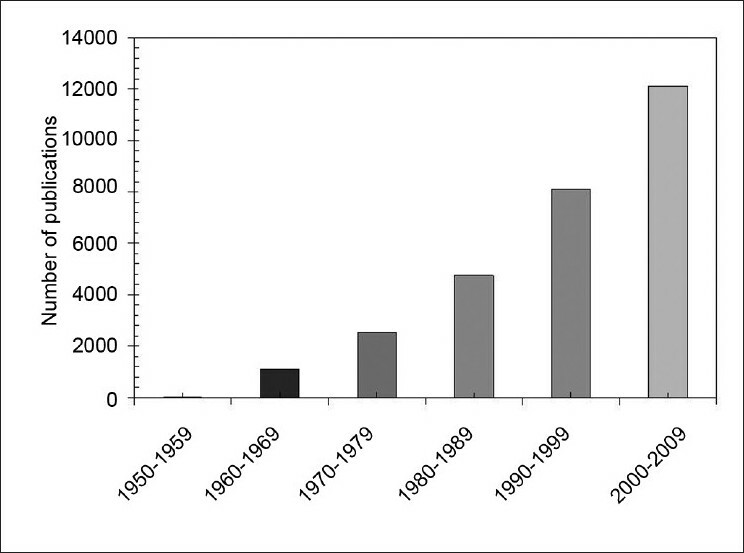 Radiation-induced cancer is of increasing clinical interest, as demonstrated by [Figure 1]. Such mutation resulting from ionizing radiation is effectively the first stage of the carcinogenic process, known as initiation. The second stage, promotion, involves the acquisition of new properties, such as immortalization, resistance to hypoxia and so on. This comes about by the accumulation of a number of faults in the genome. Subclones can arise from clones of initiated cells in which mutations have occurred. Amongst subclones, there is what Tubiana  describes as "Darwinesque" competition, which allows the the subclones that exhibitrapid growth to gain dominance. Ultimately, new subclones emerge with greater autonomy, growing more rapidly, until finally a subclone of cells exists which may proliferate autonomously. Following this stage is progression, in which the cells proliferate frequently despite the absence of stimuli. Cells eventually gain the potential for invasion of peripheral tissues or metastasis. The low doses to untargeted healthy organs in the human body that occur as a result of scattered and leaked radiation in radiotherapy have the potential to induce cancer (and other health complications) as a result of the treatment. This is a typical stochastic effect whereby the probability of cancer induction is dependent upon the dose whilst the severity is independent. Radiocarcinogenesis is the most serious potential consequence of out-of-field doses. There are several key influences on the risk of radiation-induced carcinogenesis. One factor is age. There is a higher risk at younger ages of irradiation,  as shown in [Figure 2]. 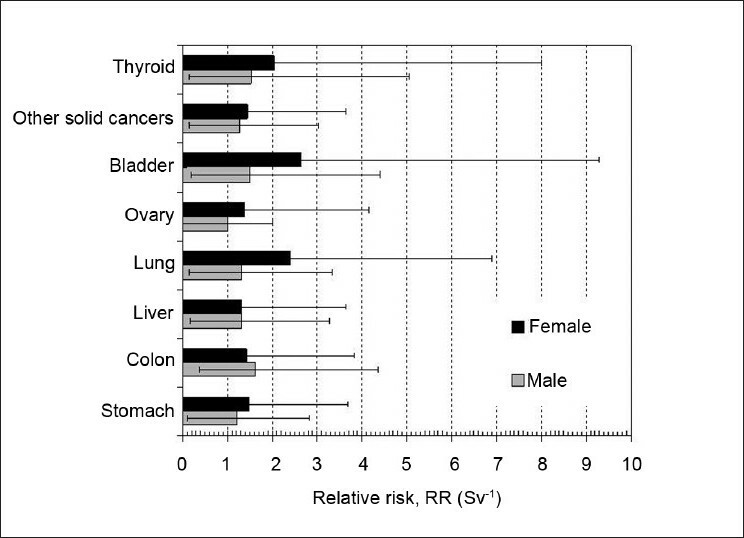 Furthermore, [Figure 2] also shows that females are more susceptible to radiation-induced carcinogenesis than males. The average lifetime attributable risk of cancer mortality is 0.76% for women and 0.51% for men (for a 0.1 Gy dose). Time since the inception of irradiation is another key factor. Generally accepted as being of single-cell origin, the development of cancer occurs as a result of successive mutations and extensive proliferation. The development of cancer relies on the unregulated proliferation of mutated cells that are not removed over time via apoptosis or immune system action. A clinically-diagnosed cancer will typically be constituted by several billion cancerous cells. The small probability of particular mutations and the accumulation thereof means process of radiation-induced carcinogenesis is very slow. For solid cancers, the latency is of the order of decades,  with the exception of sarcomas (latency may be <10 years) and leukemia (latency may be <5 years). Different tissues exhibit different degrees of susceptibility to cancer induction. [Figure 3] highlights the varying sensitivities of different organs; based on Biological Effects of Ionizing Radiation (BEIR)  data, the relative risk is given for cancer of the stomach, colon, liver, lung, ovary, bladder and other solid cancers. Obviously, another key factor affecting the incidence of secondary cancer is dose. The relationship between dose and radiocarcinogenesis is typically considered for dose regimes in two ranges: 0-2 Sv and >2 Sv. The linear no-threshold (LNT) dose-response relationship is generally accepted, ,,, and while there is some argument for nonlinear behavior (see, for instance, Tubiana and Aurengo),  ultimately the only generic approach to radiation protection that can be broadly implemented at the present time is the LNT approach. , [Figure 4] illustrates this relationship. This is an appropriate risk model for the calculation of site-specific cancer risks using the relative risk coefficients given in the BEIR  report. However, it should be noted that there are different preferred models for leukemia and breast and thyroid cancers. There is also a link between radiation exposure and non-cancer disease mortality. This is discussed in detail elsewhere. Preston et al. showed that a linear fit for the dose response is a suitable model, with the linear-quadratic model not fitting significantly better. [Table 1] shows the cause-specific excess relative risk per Sv for mortality from non-cancer diseases, based on data from the atomic bomb cohort. All this demonstrates statistically significant risks - thus we cannot neglect out-of-field doses. There have been a large number of studies over the past several decades that have investigated out-of-field doses. The majority of these involve measurement of such doses, but many also make calculations of such doses using Monte Carlo radiation transport simulation, analytical approaches, or combinations of these, as indicated in [Figure 5]. These studies are discussed in two subsections: the first devoted to conventional radiotherapy techniques; the second, to more contemporary methods (such as intensity-modulated radiation therapy) and small-field techniques such as stereotactic radiotherapy. There has been increasing strong interest in the out-of-field radiation doses from different treatment units since about the 1970s. The focus of the studies is typically either dose from an occupational radiation safety perspective (particularly in early works; and for 60 Co sources, where leakage is inevitable) or doses to untargeted critical structures in the patient's body. Broadly, regarding photon doses outside the treatment volume for 'classical' methods, one may conclude that the photon dose decreases with decreasing field size and drops approximately exponentially away from the field edge, and neutron doses are more dependent on beam energy than distance from the field edge. The advent of intensity-modulated radiotherapy (IMRT) has given rise to concerns over the fact that the total number of monitor units used is often greater than that for treatments for equivalent cases using, for instance, three-dimensional (3D) conformal radiotherapy. The additional monitor units may result in additional leakage dose and thus increase the dose to untargeted critical structures. Contemporary IMRT delivery is typically undertaken with multileaf collimators (MLCs) or mini-multileaf collimators (MMLCs) replacing, or attached as, tertiary / quaternary collimators on a linear accelerator. Many of the works discussed here involve measurements to investigate the influence of the MLC on out-of-field doses, also in the specific context of IMRT. Note that the focus of the discussion is on peripheral photon doses. Followill et al. undertook a study of doses outside the treatment fields for IMRT with 6-MV, 18-MV and 25-MV beams, for which the photon whole-body equivalent doses per cGy were 80 μSv, 6.5 μSv and 10 μSv, respectively. The respective neutron doses were 0.0 μSv, 46 μSv and 76 μSv. 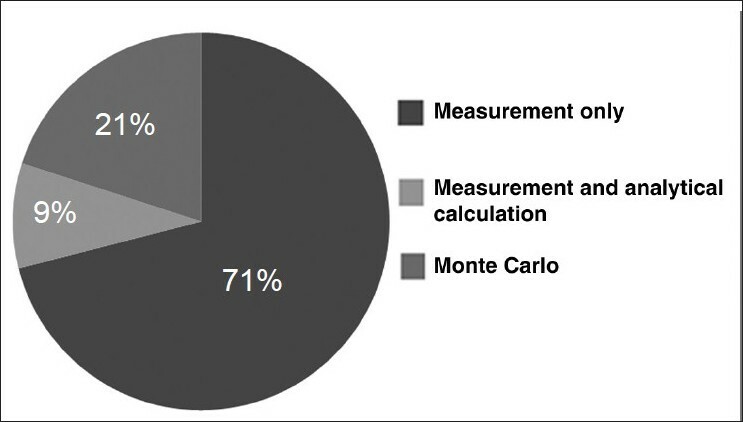 Using risk values recommended by the National Council on Radiation Protection and Measurements (NCRP), they calculated worst-case scenario risks of cancers to be between a minimum of 0.4% (for a conventional nonwedged 6-MV beam) and 24.4% (for a 25-MV tomotherapy beam). Stern  investigated whether the presence of an MLC would influence the peripheral dose when positioned at the field edge defined by the jaws. 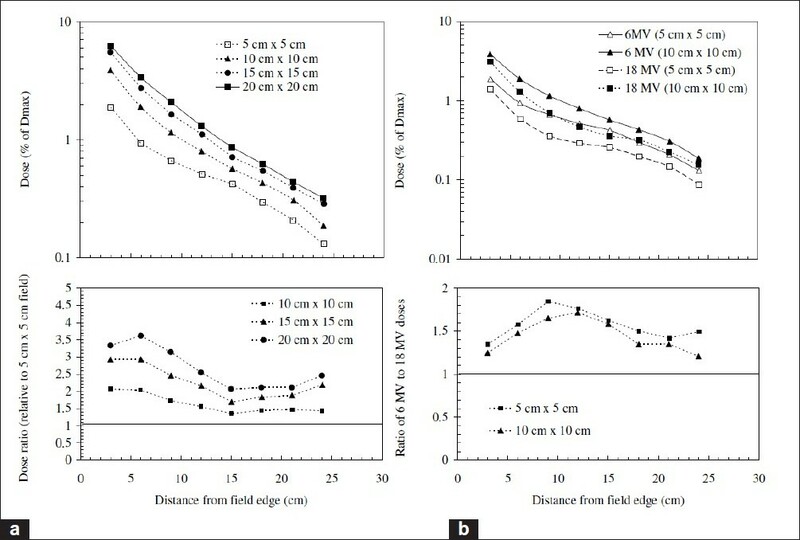 For 6-MV and 18-MV beams at all depths and distances studied, configuring the MLC leaves at the field edge yielded a reduction in peripheral dose of 6% to 50% compared to the MLC leaves fully retracted. In the latter case, peripheral doses matched those for a linac without an MLC. As mentioned earlier, the AAPM report TG-36 can be used to estimate the peripheral dose distributions. Mutic and Klein  undertook a number of measurements with an ionization chamber in a water-equivalent plastic phantom with various MLC leaf settings, including full retraction. Peripheral dose distributions with the MLC fully retracted and collimator rotated to 180° were similar to TG-36 data, but lower with MLC field shaping. They also showed that rotating the collimator to 90° with full MLC retraction may reduce the peripheral dose up to a factor of 3 (compared to TG-36). Chibani and Ma  employed Monte Carlo N-Particle eXtended (MCNPX) to study the dose from photon-induced nuclear particles (neutrons, protons and alpha particles). 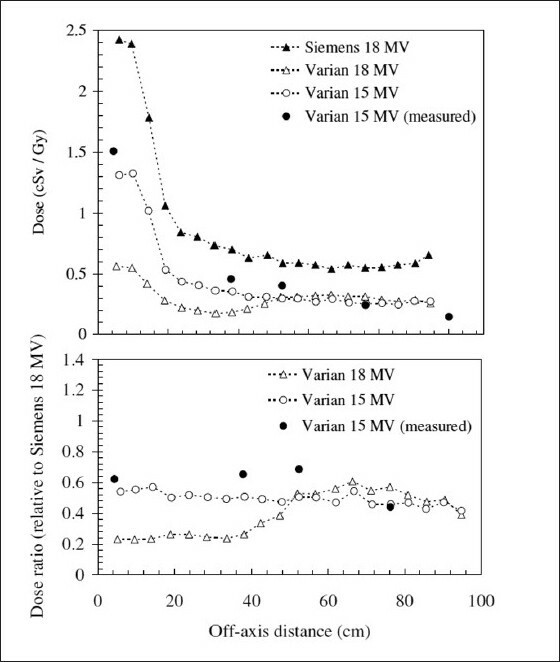 Varian beams are found to produce more particles than the Siemens beams, due to higher primary electron energies. Neutrons are found to contribute more than 75% of the total dose-equivalent ratio. Chibani and Ma compared the model to measurements. 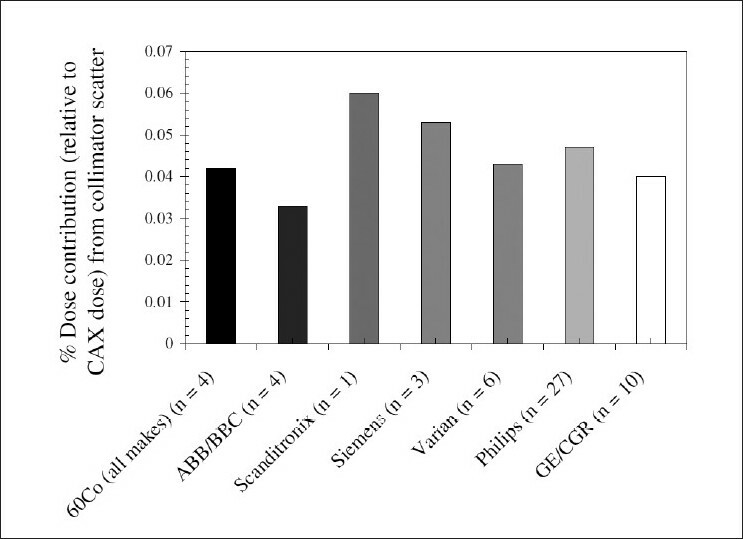 The dose-equivalent from leakage neutrons (at 50 cm off-axis distance) represents 1.1%, 1.1% and 2.0% likelihood of fatal secondary cancer from a 70-Gy treatment delivered by the Siemens 18-MV, Varian 15-MV and Varian 18-MV beams, respectively. Vanhavere et al. performed measurements in air, at different depths in a plexi-phantom and using a Rando-Alderson phantom for gammas and neutrons with an 18-MV linac. Organ equivalent doses and effective doses (estimated by different methods) were evaluated for a range of organs. For a prostate cancer IMRT treatment, the effective dose (using Rando-Alderson phantom) was found to be about 30 mSv per 2 Gy target dose, 13% of which is attributed to neutrons. Sharma et al. noted that dynamic fields (consisting of constant-width strips moved from one bank to the other) required between 2 and 14 times as many monitor units as static fields to achieve the same dose at isocenter, for various arrangements. Peripheral doses were between 2 and 15 times higher for the dynamic case, depending on field size, etc. They also compared patient-specific intensity-modulated fields with dynamic MLC fields with similar jaw settings and discovered that the two are sufficiently similar to use the dynamic MLC data to predict out-of-field doses for comparable patient-specific cases. Kry et al. highlighted that determination of such out-of-field doses requires tedious measurement or calculations that exhibit high uncertainty. They used the MCNPX Monte Carlo code to model a Varian Clinac 2100 operated at 6 MV, modeling dose distributions away from the central axis and measuring dose distributions with an ionization chamber (in a water phantom) and TLD (in an acrylic phantom). In a different publication, Kry et al. describe a similar study for 18-MV photons. In the latter work, discussion of neutron dose was also included. Wiezorek et al. performed point dose measurements at different depths in a solid phantom at 29 cm off-axis distance, for a Siemens Oncor Impression linac with energies of 6 and 15 MV. Peripheral doses associated with artificial fluence distributions were compared with open beam contributions. Measurements were performed with two types of TLDs to quantify photon and neutron doses separately. Neutrons were only detected for 15 MV. The photon contribution to peripheral dose increased (compared to open field) when using segmented multileaf modulation (sMLM) for IMRT, and even further when using compensators. Also of interest are the out-of-field doses from the small fields used in stereotactic radiotherapy (SRT). The doses involved in SRT are generally much higher than those in IMRT treatments, and are delivered in relatively few fractions. (Note that stereotactic radiosurgery involves a single fraction only.) Another point worth noting is that patients often receive stereotactic treatment for non-malignant lesions - and thus have relatively long potential lifetimes. The out-of-field doses from these high-dose treatments are thus of significant interest. Ioffe et al. quantified the dose rate as a function of distance from the isocenter in a RANDO phantom for Gamma-Knife treatments. Hasanzadeh et al. constructed an anthropomorphic phantom and undertook TLD measurements of dose in untargeted organs for Gamma-Knife radiosurgery. Petti et al. developed Cyber-Knife plans for a thorax lesion and brain lesion in an anthropomorphic phantom and measured the dose at various depths and distances outside the treatment field using TLD. Peripheral doses were found to be 2 to 5 times higher than those in a comparable Gamma-Knife treatment, and up to 4 times higher than those in an IMRT treatment. The relatively large peripheral dose is attributed to greater leakage of the Cyber-Knife unit. Chuang et al. investigated reduction of out-of-field doses from the Cyber-Knife system resulting from a shielding upgrade, with the observation that doses were generally reduced by 20% to 55%. Maarouf et al. examined the radiation exposure of organs at risk and assessed the risk of late effects (such as secondary tumors or hereditary disorders) following stereotactic linac radiosurgery of intracranial tumors. TLDs were placed superficially on patients' (n= 21) eyelids, thyroid, breast and regions of the ovary / testes. The organ receiving the highest doses was the eye lens (276 ± 200 mGy), followed by the thyroid (155 ± 83 mGy), breast (47 ± 22 mGy), ovary (12 mGy) and lastly the testes (9 ± 3 mGy). The absorbed doses thus ranged between 0.025% and 0.76% of the target dose. They recommended the use of conformal beams employing micro-multileaf collimators and avoiding beams directed toward the trunk. Solberg et al. compared conventional noncoplanar arc, static field conformal and dynamic arc field shaping approaches to radiosurgery. In terms of peripheral dose, it was found to decrease as additional beams or arc degrees were added with either of the conformal approaches. Ultimately, dynamic arc shaping was found to be preferred for its efficiency and efficacy in delivery of a homogenous dose whilst minimizing peripheral dose, for radiosurgery applications. More recently, Taylor et al. investigated out-of-field doses from mini-multileaf collimator-shaped fields, and described a number of simple techniques for the minimization of out-of-field dose and its associated risks. The authors found doses of the order of cGy in out-of-field regions - a substantial dose in radiation protection terms - and observed that simple treatment techniques such as aligning the craniocaudal direction of the patient with the x-plane of the collimator can reduce dose by up to an order of magnitude. The latter result was confirmed in a later study of doses in small-field radiotherapy of pediatric patients, whereby Taylor et al. found that doses are, on average, 40% less along the x-plane (compared to the y-plane). Furthermore, the authors also found that far from the primary field, about half the out-of-field dose is due to leakage; that the use of a linac with a bending magnet resulted in dose about 40% higher than the straight waveguide unit; and that coplanar treatments with beams avoiding the trunk of the body can reduce dose to organs at risk by an order of magnitude. Tomotherapy is another modality of interest in terms of out-of-field doses. Tomotherapy almost invariably involves a larger number of 'monitor units' than an equivalent treatment delivered by conventional radiotherapy, with leakage being a major possible source of out-of-field doses delivered to patients. , There have also been studies on proton beam therapy in relation to out-of-field doses. These methods are not discussed in any greater detail here because the focus of this work is conventional external-beam radiotherapy, which is far more widely employed than the latter methods. IMRT treatments often require between 3 and 5 times the number of monitor units to deliver (compared to a conventional treatment). Kry et al. measured the photon and neutron out-of-field dose equivalents to various organs using different treatment strategies, energies and accelerators. Photon dose decreased exponentially away from primary field; neutron dose was found to be independent of the distance from treatment field. 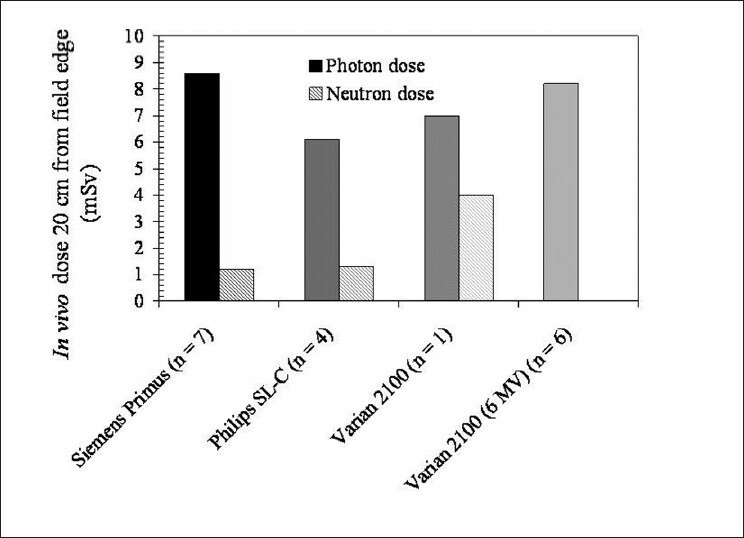 Neutrons contributed significantly to out-of-field dose for E> 15 MeV. Considering out-of-field doses, Kry et al. found that the maximum risk of fatal secondary malignancy was 1.7% for conventional radiation, 2.1 % for IMRT with 10-MV x-rays and 5.1% for IMRT with 15-MV x-rays. Kry et al. also examined the uncertainty in risk estimates relating to out-of-field doses, with the result that risk estimates for secondary malignancy were subject to very large uncertainties. It was shown, however, that it is possible with relatively good accuracy to identify preferable modalities based on the ratio of risk estimates. In a recent study, Ruben et al. compared IMRT with three-dimensional Conformal Radiation Therapy (CRT) in terms of carcinogenic risk. Equivalent plans were constructed for prostate, breast and head-and-neck treatments. The risk of radiation-induced malignancies in organs outside the target volume was calculated using two dose-response models for radiocarcinogenesis. Ultimately, the risks were found to be comparable between the two modalities. Depending on the technique and region of interest, risks ranged between 1% and 2% for one risk model, and between 0.5% and 1% for the other model. There is a significant body of literature covering epidemiological studies of cancer induction in radiotherapy patients, an overview of which is given in the subsequent section. Reft et al. performed in vivo patient and phantom measurements of the secondary out-of-field photon and neutron dose equivalent for 18-MV IMRT treatments. It was found that the photon dose dropped by a factor of two for distances of 10 and 20 cm from the field edge, while the neutron dose remained the same (within experimental uncertainties). There is an indication that 18-MV IMRT results in higher neutron doses (factor of 2 or 3) compared to three dimensional CRT (3DCRT). Klein et al. collected peripheral dose data in a phantom at distances ranging from 5 to 72 cm away from the field edges of small (2 to 10 cm) IMRT fields. Micro-ionization and cylindrical ionization chambers were arranged in a phantom representing a 3-year-old child at locations corresponding to the thyroid, breast, ovaries and testes. Distant peripheral dose (dominated by head scatter) was higher than predicted. For example, doses to the testes were 3 to 5 times higher for IMRT compared to conventional treatment. There are a range of influences on the out-of-field dose, which are detailed in the following section. Out-of-field dose is essentially the combination of leakage from the accelerator head, scatter from collimators, from within the patient's body and from the rest of the treatment room. It is possible to reduce out-of-field doses (and corresponding risks to the patient) by careful choice of treatment arrangement. To help facilitate this, the main influences on out-of-field dose are discussed here. Because out-of-field dose to untargeted regions of a patient's body is a result of a combination of leakage and scatter, it is likely that different linac models (having different shielding designs) will generate different out-of-field doses. [Figure 6] illustrates this quite clearly for a Siemens Primus, Varian 2100 and Philips SL-C operated at 18 MV (listed in order of decreasing out-of-field photon dose). As discussed, the influence of leakage, collimator scatter and patient-scatter may be inferred to some extent by the influence of field size [Figure 7](b). A number of authors have made explicit attempts to determine separate influences of these. [Figure 10](a) directly indicates that the (percentage of central axis, CAX) dose attributable to patient-scatter decreases with increasing distance. 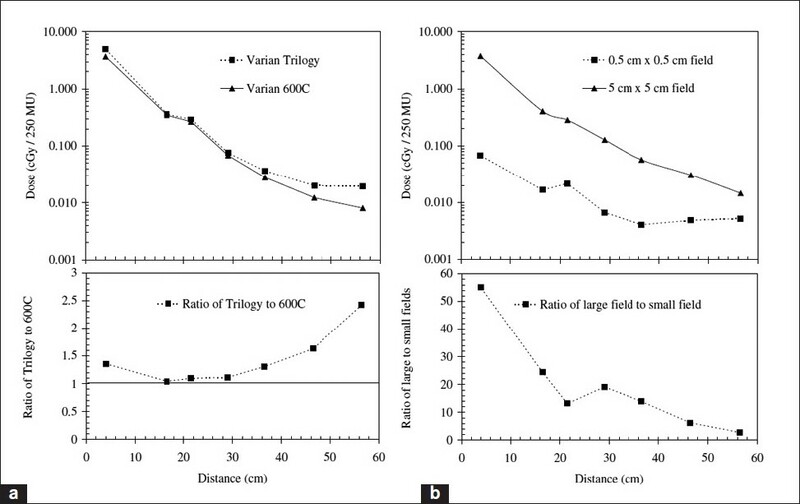 Van der Giessen  treated the collimator scatter and leakage together, and from [Figure 10](b) it is clear that the different field sizes converge far from the primary beam, and the contribution to out-of-field dose "plateaus." The orientation of the collimator has been shown to have a significant effect on out-of-field dose. Taylor et al. found that preferentially aligning the craniocaudal axis of the patient with the x-plane (defined by the direction of jaw motion and effected by rotating the collimator appropriately) can reduce the out-of-field dose by up to an order of magnitude for a Varian 600C linac. In a study of out-of-field dose in pediatric radiotherapy, it was shown that alignment with the x-plane on other Varian linacs can also achieve a significant reduction in out-of-field dose. The percentage contribution to out-of-field dose (relative to central axis dose) due to collimator scatter generally differs amongst machines, as indicated by [Figure 11]. The nature of the treatment affects the out-of-field dose. Intensity-modulated radiotherapy (IMRT) is of particular interest in this regard, , as discussed earlier, because it typically involves a greater number of monitor units than other delivery methods. Wang and Xu  found that out-of-field doses are indeed significantly higher for an IMRT treatment than for conformal radiotherapy (CRT), as shown in [Figure 12](a). Sharma et al. 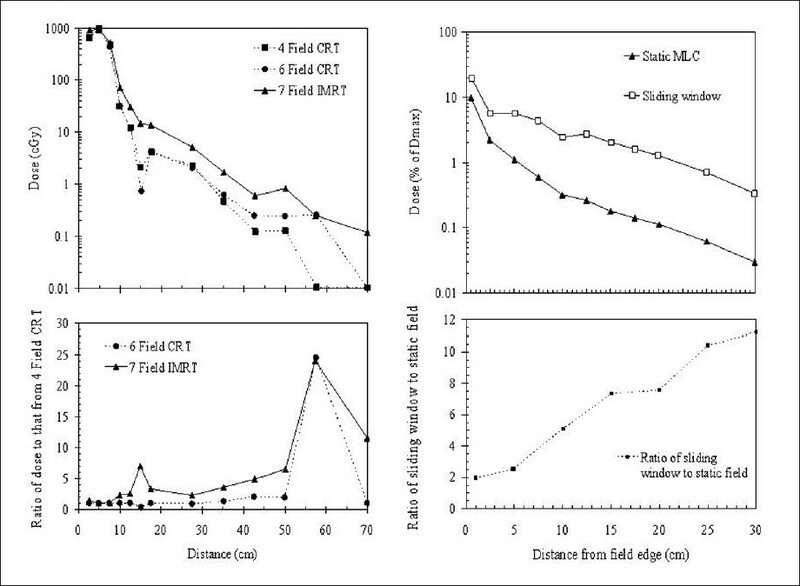 showed that achieving an equivalent field size with a sliding field rather than a static MLC can result in an increase in out-of-field dose of up to an order of magnitude; see [Figure 12](b). Hall and Wu  found that IMRT of prostate cancer rather than conventional radiotherapy resulted in double the risk of fatal secondary cancer (3% Sv -1 compared to 1.5% Sv -1 ). Kry et al. found that 18-MV IMRT with a Varian unit resulted in a risk of fatal secondary cancer of 5.1% Sv -1 , while the risk for 18-MV conventional radiotherapy was 1.7%. There is strong evidence for radiation-induced cancer, even at low dose levels, such as those due to out-of-field dose from radiotherapy procedures. , The International Commission on Radiological Protection  does not assign specific dose limits to patients undergoing radiotherapy, precisely because it is the cell-killing function of ionizing radiation that is the desired effect, and restricting any dose may reduce the efficacy of the treatment. Few would argue with the notion that the curative effects of radiation therapy outweigh the potential detrimental consequences; nonetheless, there is clearly a need to maintain an awareness of out-of-field doses and the risks they pose to patients. This is of particular importance in certain contexts, such as the treatment of pediatric patients. In cases where out-of-field doses may be more critical, such as treatment of a pediatric patient or pregnant female, it is worthwhile considering the various influences on out-of-field dose. Where possible, attempts should be made to choose delivery parameters that result in an equivalent treatment to the targeted lesion but are likely to generate less out-of-field dose. 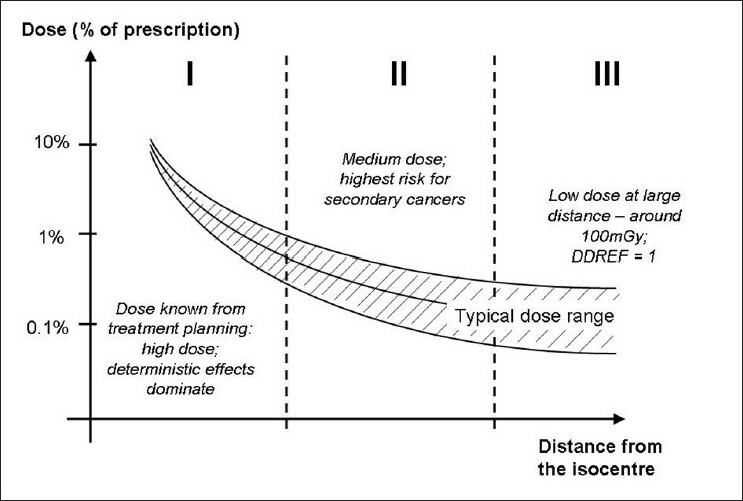 A summary of parameters that influence out-of-field dose is given in [Table 2]. Note that these are not strict rules, but merely general observations based on the data presented in the present review. It is strongly recommended that each institute / clinic undertake its own measurements of out-of-field dose using equipment available, and use these measurements to inform clinical decisions. There is an increasing awareness of out-of-field doses and their corresponding long-term risks in radiotherapy. One can consider 3 broad regimes of out-of-field dose, illustrated in [Figure 13]. Close to the primary field, where deterministic effects are relevant, the treatment planning systems typically calculate doses well. Centimeters beyond the penumbra (where stochastic effects are the relevant risk), planning systems tend not to predict dose accurately, and a Monte Carlo model that accurately calculates collimator scatter and patient-scatter would be the preferable option for dose determination. Far from the primary field, where low-risk stochastic effects are relevant, measurement of the leakage dose would best inform risk assessment - since it is difficult and computationally-intensive to achieve accurate Monte Carlo predictions of leakage dose at large distances. It is conceivable that the increasing efficacy of radiotherapy, which serves to increase patients' lifetimes, will result in greater consideration of potential late effects, such as radiation-induced cancer. There are notable relationships between out-of-field dose and treatment parameters, which indicates that plan optimization in terms of out-of-field dose reduction is achievable. This work was financially supported by National Health and Medical Research Council (NHMRC), Australia - Project Grant 555420. 1. Suit H, Goldberg S, Niemierko A, Ancukiewicz M, Hall E, Goitein M, et al. Secondary carcinogenesis in patients treated with radiation: A review of data on radiation-induced cancers in human, non-human primate, canine and rodent subjects. Radiat Res 2007;167:12-42. 2. Xu X, Bednarz Baarli J, Paganatti H. A review of dosimetry studies on external-beam radiation treatment with respect to cancer induction. Phys Med Biol 2008;53:R193-241. 3. Tubiana M. Can we reduce the incidence of second primary malignancies occurring after radiotherapy? A critical review. Radiother Oncol 2009a;91:4-15. 4. ICRP.Low-dose extrapolation of radiation-related cancer risk. Oxford: ICRP Publication 99 Ann; 2005. 5. BEIR. Committee on the biological effects of ionizing radiation (BEIR VII Phase 2): Health risks from exposure to low levels of ionizing radiation. Washington DC: National Research Council, National Academy Press; 2006. 6. ICRP.The 2007 Recommendations of the International Commission on Radiological Protection. Oxford: ICRP Publication 103 Ann; 2007. 7. Latarjet R. Interaction of radiation energy with nucleic acids. Curr Top Radia Res Quarterly 1972;8:1-38. 8. Hutterman J, Kohlein W, Teoule R, Bertinchamps A. Effects of Ionizing Radiation on DNA. Berlin: Springer-Verlag; 1978. 9. Teebor G, Frenkel K, Goldstein M. Ionizing radiation and tritium transmutation both cause formation of 5-hydroxymethyl-2'-deoxyuridine in cellular DNA. Proc Nat Acad Sci 1984;81:318-21. 10. Errera M. Les effets des radiations nucleaires. La Recherche 1985;16:959-68. 11. Thacker J. The use of recombinant DNA techniques to study radiation-induced damage, repair and genetic change in mammalian cells. Int J Rad Biol 1986;50:1-30. 12. Ward J. Biochemistry of DNA lesions. Radiat Res Suppl 1985;8:S103-11. 13. Lobrich M, Rydberg B, Cooper P. Repair of X-Ray-induced DNA double-strand breaks in specific not i restriction fragments in human fibroblasts: Joining of correct and incorrect ends. Proc Nat Acad Sci USA 1995;92:12050-4. 14. Tubiana M. La prévention du cancer et la relation dose-effet: L'effet cancérogene des rayonnements ionisants Cancer/Radiothérapie 2009b;13:238-58. 15. Preston DL, Ron E, Tokuoka S, Funamoto S, Nishi N, Soda M, et al. Solid cancer incidence in atomic bomb survivors: 1958-1998. Radiat Res 2007;168:1-64. 16. Preston D, Pierce D, Shimizu M, Cullings H, Fujita S, Funamoto S, et al. Effect of recent changes in atomic bomb survivor dosimetry on cancer mortality risk estimates. Radiat Res 2004;162:377-89. 17. ICRP. The 1990 Recommendations of the International Commission on Radiological Protection ICRP Report 60 Ann. Oxford: ICRP; 1991. 18. Tubiana M, Aurengo A. Dose-effect relationship and estimation of the carcinogenic effects of low doses of ionising radiation: The Joint Report of the Academie des Sciences (Paris) and of the Academie Nationale de Medecine. Int J Low Radiat 2006;2:135-53. 19. Kron T. An introduction to radiation protection in medicine. Boca Raton USA: Taylor and Franicis; 2008. 20. Mazonakis M, Zacharopoulou F. Peripheral dose measurements for 6 and 18 MV photon beams on a linear accelerator with multileaf collimator. Med Phys 2008;35:4396-403. 21. Pierce D, Preston D. Radiation-related cancer risks at low doses among atomic bomb survivors. Radiat Res 2000;154:178-86. 22. Shimizu M, Pierce D, Preston D, Mabuchi K. Studies of the mortality of atomic bomb survivors. Report 12, Part II. 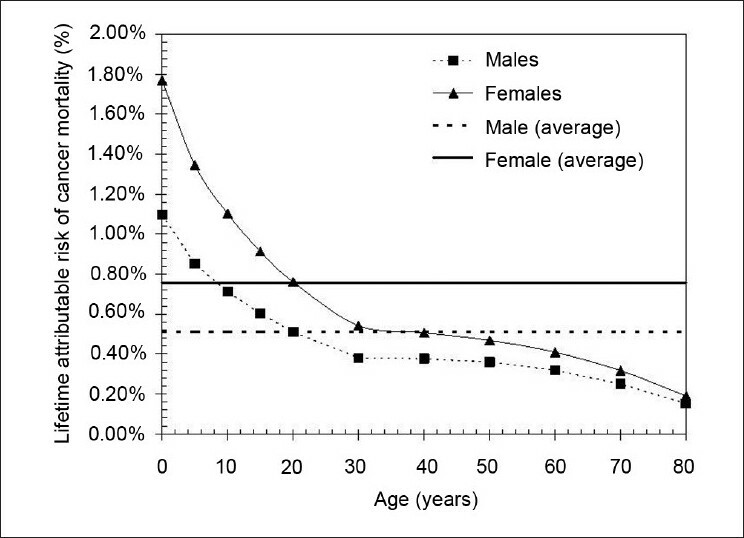 Noncancer mortality: 1950-1990 Radiat Res 1999;152:374-89. 23. Preston D, Shimizu M, Pierce D, Suyama A, Mabuchi K. Studies of mortality of atomic bomb survivors. Report 13: Solid cancer and noncancer disease mortality: 1950-1997 Radiat Res 2003;160:381-407. 24. Fraass B, Geijn JV. Peripheral dose from megavolt beams. Med Phys 1983;10:809-18. 25. Kase K, Svensson G, Wolbarst A, Marks M. Measurements of dose from secondary radiation outside a treatment field. Int J Radiat Oncol Biol Phys 1983;9:1173-83. 26. Francois P, Beurtheret C, Dutreix A. Calculation of the dose delivered to organs outside the radiation beams. Med Phys 1988;15:879-83. 27. Stovall M. AAPM Radiation Therapy Committee Task Group Report 36: Fetal dose from radiotherapy with photon beams. Med Phys 1995;22:63-82. 28. 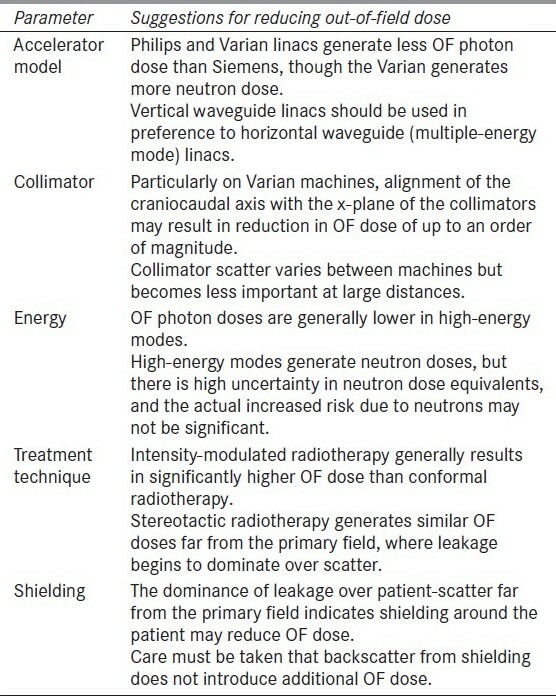 Van der Giessen P. Collimator-related radiation dose for different cobalt machines and linear accelerators. Int J Radiat Oncol Biol Phys 1996;35:399-405. 29. Van der Giessen P. PhD Thesis Dose outside the irradiated volume in radiotherapy. Gottingen Tilberg: The Netherlands; 1997a. 30. Van der Giessen P, Hurkmans C. Calculation and measurement of the dose to points outside the primary beam for Co-60 gamma radiation. Int J Radiat Oncol Biol Phys 1993;27:717-24. 31. Van der Giessen P. Calculation and measurement of the dose at points outside the primary beam for photon energies of 6, 10 and 23 MeV. Int J Radiat Oncol Biol Phys 1994;30:1239-46. 32. Van der Giessen P. Measurement of the peripheral dose for the tangential breast treatment technique with Co-60 gamma radiation and high energy X-rays. Radiother Oncol 1997b;42:265-70. 33. Van der Giessen P, Bierhuizen W. Comparison of measured and calculated peripheral doses in patients undergoing radiation therapy Radiother Oncol 1997;42:257-64. 34. Followill D, Stovall M, Boyer A. Estimates of whole-body dose equivalent produced by beam intensity modulated conformal therapy. Int J Radiat Oncol Biol Phys 1997;38:667-72. 35. Stern R. Peripheral dose from a linear accelerator equipped with multileaf collimation. Med Phys 1999;26:559-63..
36. Mutic S, Klein E. A reduction in the AAPM TG-36 reported peripheral dose distributions with tertiary multileaf collimation. Int J Radiat Oncol Biol Phys 1999;44:947-53. 37. Chibani O, Ma C. Photonuclear dose calculations for high-energy photon beams from Siemens and Varian linacs Med Phys 2003;30:1990-2000. 38. Vanhavere F, Huyskens D, Struelens L. Peripheral neutron and gamma doses in radiotherapy with an 18 MV linear accelerator. Radiat Protect Dosim 2004;110:607-12. 39. Sharma SA, Deshpande S, Phurailatpam R, Deshpande D, Shrivastava S, Dinshaw K. Peripheral dose from uniform dynamic multileaf collimation fields: Implications for sliding window intensity modulated radiotherapy. Br J Radiol 2006a;9:331-5. 40. Sharma S, Upreti R, Deshpande D. Use of peripheral dose data from uniform dynamic multileaf collimation fields to estimate out-of-field organ dose in patients treated employing sliding window intensity modulated radiotherapy Physics in Medicine and Biology 2006b;51:2987-95. 41. Kry SF, Titt U, Pönisch F, Followill D, Vassiliev ON, White RA, et al. 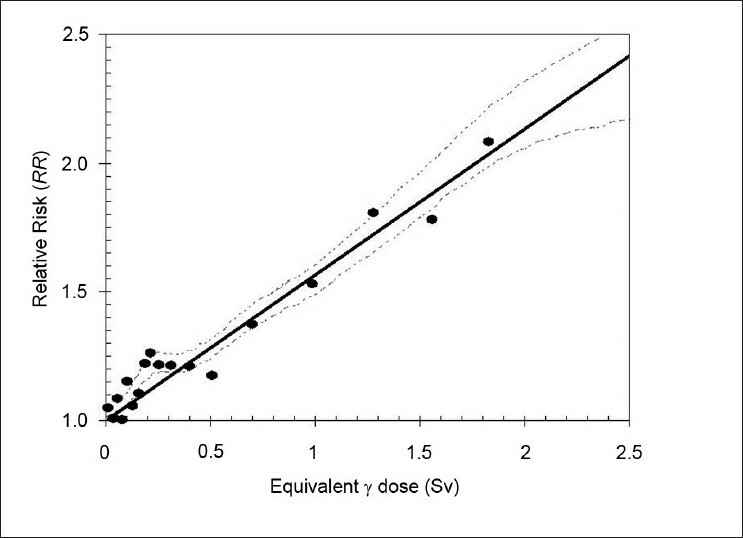 A Monte Carlo model for calculating out-of-field dose from a Varian 6 MV beam. Med Phys 2006;33:4405-13. 42. Kry SF, Titt U, Followill D, Pönisch F, Vassiliev ON, White RA, et al. 2007b A Monte Carlo model for out-of-field dose calculation from high-energy photon therapy. Med Phys 2007b;34:3489-99. 43. Wiezorek T, Voigt A, Metzger N, Georg D, Schwedas M, Salz H, et al. Experimental determination of peripheral doses for different IMRT techniques delivered by a Siemens linear accelerator. Strahlenther Onkol 2008;184:73-9. 44. Ioffe V, Hudes R, Shepard S, Simard J, Chin L, Yu C. Fetal and ovarian radiation dose in patients undergoing gamma knife surgery. Surg Neurol 2002;58:32-41. 45. Hasanzdeh H, Sharafi A, Verdi M, Nikoofar A. Assessment of absorbed dose to thyroid, parotid and ovaries in patients undergoing gamma knife radiosurgery. Phys Med Biol 2006;51:4375-83. 46. Petti P, Chaung C, Smith V, Larson D. Peripheral doses in CyberKnife radiosurgery. Med Phys 2006;33:1770-9. 47. Chuang C, Larson D, Zytkovicz A, Smith V, Petti P. Peripheral dose measurement for CyberKnife radiosurgery with upgraded linac shielding. Med Phys 2008;35:1494-6. 48. Maarouf M, Treuer H, Kocher M, Voges J, Gierich A, Sturm V. Radiation exposure of extracranial organs at risk during stereotactic linac radiosurgery. Strahlenther Onkol 2005;181:463-7. 49. Solberg T, Boedeker K, Fogg R, Selch M, DeSalles A. Dynamic arc radiosurgery field shaping: A comparison with static field conformal and noncoplanar circular arcs. Int J Radiat Oncol Biol Phys 2001;49:1481-91. 50. Taylor ML, McDermott LN, Johnston PN, Haynes M, Ackerly T, Kron T, et al. Stereotactic fields shaped with a micro-multileaf collimator: Systematic characterisation of peripheral dose. Phy Med Biol 2010b:55 873-81. 51. Taylor ML, Kron T, Franich RD. Assessment of out-of-field doses in radiotherapy of brain lesions in children. Int J Radiat Oncol Biol Phys 2011;79:927-33. 52. Mutic S, Low D. 1998 Whole body dose from tomotherapy delivery. Int J Radiat Oncol Biol Phys 1998;42:229-32. 53. Ramsey C, Seibert R, Mahan S, Desai D, Chase D. Out-of-field dosimetry measurements for a helical tomotherapy system. J Appl Clin Med Phys 2006;7:1-11. 54. Kry S, Salehpour M, Followill D, Stovall M, Kuban D, White R, Rosen I. 2005b Out of field photon and neutron dose equivalents from step-and-shoot intensity-modulated radiation therapy. Int J Radiat Oncol Biol Phys 2005b;62:1204-16. 55. Kry S, Salehpour M, Followill D, Stovall M, Kuban D, White A, Rosen I. The calculated risk of fatal secondary malignancies from intensity-modulated radiaiton therapy. Int J Radiat Oncol Biol Phys 2005a;62:1195-203. 56. Kry S, Followill D, White R, Stovall M, Kuban D, Salehpour M. Uncertainty of calculated risk estimates for secondary malignancies after radiotherapy. Int J Radiat Oncol Biol Phys 2007a;68:1265-71. 57. Ruben J, Davis S, Evans C, Jones P, Gagliardi F, Haynes M, Hunter A. The effect of intensity-modulated radiotherapy on radiation-induced second malignancies. Int J Radiat Oncol Biol Phys 2008;70:1530-6. 58. Reft C, Runkel-Muller R, Myrianthopoulos L.In Vivo and phantom measurements of the secondary photon and neutron doses for prostate patients undergoing 18 MV IMRT. Med Phys 2006;33:3734-42. 59. Klein E, Maserang B, Wood R, Mansur D. Peripheral doses from pediatric IMRT. Med Phys 2006;33:2325-531. 60. Klein O, Nishina Y. Über die Streuung von Strahlung durch freie Elektronen nach der neuen relativistischen Quantendynamik von Dirac Z. Physik 1929;52:853-68. 61. Kry S, Salehpour M, Titt U, Allen White R, Stovall M, Followill D. Monte Carlo study shows no significant difference in second cancer risk between 6- and 18-MV intensity-modulated radiation therapy. Radiother Oncol 2009;91:132-37. 62. Hall E. Intensity-modulated radiation therapy, protons, and the risk of second cancers. Int J Radiat Oncol Biol Phys 2006;65:1-7. 63. Wang B, Xu X. Measurements of non-target organ doses using mosfet dosimeters for selected IMRT and 3D CRT radiation treatment procedures. Radiat Protect Dosim 2008;128:336-42. 64. Hall E, Wuu C. Radiation-induced second cancers: The impact of 3D-CRT and IMRT Int J Radiat Oncol Biol Phys 2003;56:83-8. 9 Implant breast reconstruction followed by radiotherapy: Can helical tomotherapy become a standard irradiation treatment? Lonski, P. and Taylor, M.L. and Franich, R.D. and Harty, P. and Kron, T.
Taylor, M.L. and Kairn, T. and Kron, T. and Dunn, L. and Johnston, P.N. and Franich, R.D. 14 Implant breast reconstruction followed by radiotherapy: Can helical tomotherapy become a standard irradiation treatment? Massabeau, C. and Fournier-Bidoz, N. and Wakil, G. and Castro Pena, P. and Viard, R. and Zefkili, S. and Reyal, F. and Campana, F. and Fourquet, A. and Kirova, Y.M. Dabaja, B. and Wang, Z. and Stovall, M. and Baker, J.S. and Smith, S.A. and Khan, M. and Ballas, L. and Salehpour, M.R. Simões, H., Pinto, M., Cunha, M., Gonçalves, J., Sampaio, L., Ferreira, R.J., Saraiva, H.M., (...), Crespo, P.